For the english version of this post, please click here. Για αρκετό καιρό η γραφειοκρατία δεν μας επέτρεπε να διαθέσουμε το Calculator Ultimate στην Ελλάδα. Αυτό, επιτέλους εδώ και μερικούς μήνες έχει αλλάξει. Η Google συνεχίζει να μην μας επιτρέπει να διαθέσουμε εφαρμογές προς πώληση μέσω του Google Play, αλλά πλέον υπάρχουν εναλλακτικές! 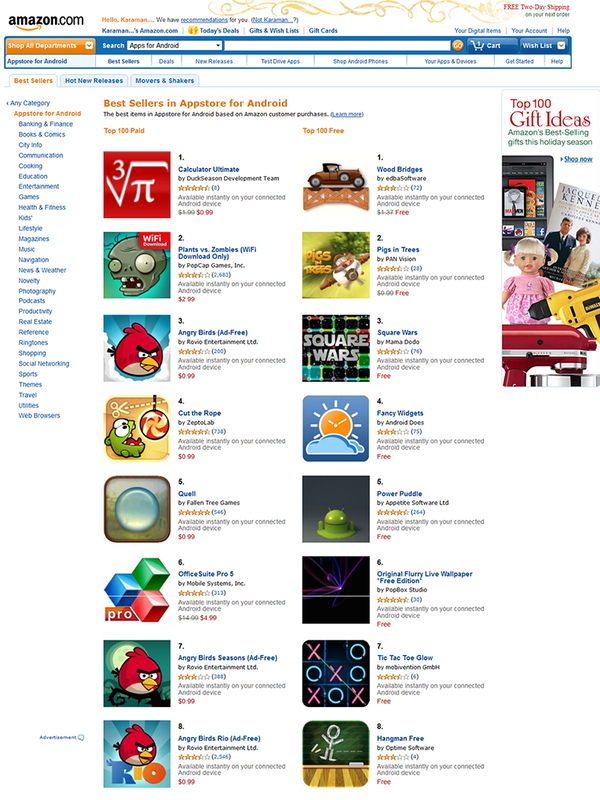 του Amazon Appstore. Το Amazon.com (ίσως και τα υπόλοιπα Amazon stores π.χ. Amazon.co.uk) πουλά πλέον και στην Ελλάδα από το καλοκαίρι του 2013. Η αγορά και εγκατάσταση γίνεται μέσω του Amazon Appstore application το οποίο μπορεί να εγκατασταθεί σε οποιαδήποτε συσκευή Android. Lately we had support requests for Calculator Ultimate, like “I cannot find full version” or “How can I download it”. Actually, bureaucracy prevents us from making Calculator Ultimate available through Google Play, so let us try clear everything out. For the greek version of this post, please click here. We are glad to announce that our products are now available World Wide for Samsung Android devices through Samsung Apps. Calculator Ultimate Lite is already available for most Samsung devices and more are coming. Calculator Ultimate will becoming available during the next days for all Samsung Android Devices. We hope that everybody will benefit from this opportunity and find a useful tool on our application. As new products become available from duckseason you will be able to find them on Samsung apps also. We are proud to announce a powerful Graph engine as a new feature on Calculator Ultimate 1.5.0. It will be available to all users of Calculator Ultimate in the next few days at no additional cost. You can find the Graph f(x) button on Eq tab. It enables a dialog where you can enter the function you desire to depict. Pressing the Draw button will make the Graph and show it on screen. You can move and zoom in/out as desired. Please note that the graph feature is currently on “Beta test phase” so we would like all of you if possible to send us your feedback at support[AT]duckseason[DOT]mobi. We hope that all of you will find our Graph Feature helpful and a worthy addition to Calculator Ultimate.